A region attachment is a simple, rectangular image that is attached to a bone. It gets the name "region" because at runtime (in your game) it is typically drawn using a region from a texture atlas. A region attachment is created from an image under the Images node in the tree. See Images node for more information. A region attachment has a number of properties shown at the bottom of the tree. When the path is blank, the region attachment name is used to find the image. When the path is set, it is used instead of the region attachment name. See Image file lookup for more information. 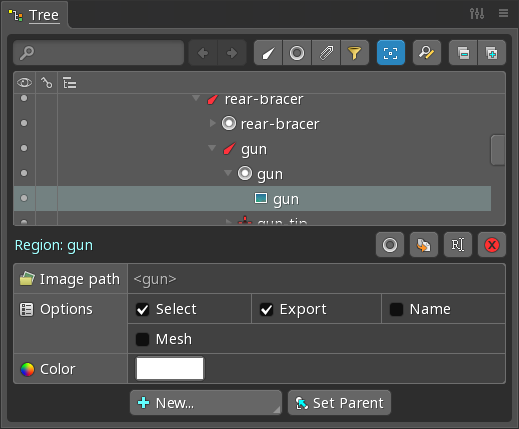 The Mesh checkbox converts the region attachment to a mesh attachment. See Meshes for more information. When Background is checked for a region attachment in the properties at the bottom of the tree, the region attachment can no longer be selected and won't be exported. This can be convenient to bring in images to be used for reference, such as background images or the fully assembled skeleton for use as a template. The color can optionally be set on the region attachment to more easily distinguish it from the rest of the images. The color tints the region attachment image, but cannot be changed during animations. 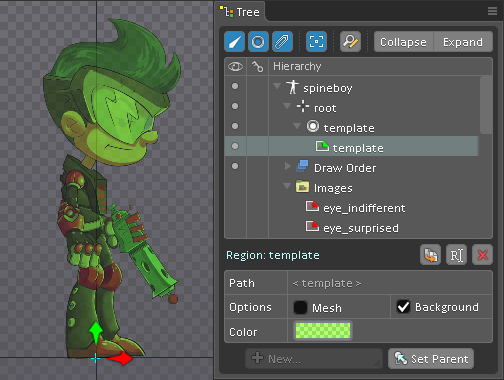 To animate the color, set the slot color instead of the region attachment color. A region attachment's transform can be copied by selecting the attachment and pressing ctrl+C (cmd+C on Mac). The transform can later be applied to another region attachment by selecting it and pressing ctrl+V (cmd+V on Mac). This sets the scale, rotation, and translation to the copied values. Another way to copy the transform of a region attachment is to drag and drop one attachment on to another. The dragged attachment's slot will change and have its transform adjusted to match the attachment it was dropped on.